(Newser) – Hunters hoping to take advantage of Florida's weeklong bear hunt—the first in 21 years—have had to shoulder their rifles after just two days. "I have signed the order to close the hunt," Nick Wiley of the state's wildlife commission said Sunday after 295 bears were killed. The number is likely to rise as hunters have 12 hours to report their kills. Wiley said the max limit of 320 bears would likely be exceeded with another day of hunting, adding, "We'd rather err on the conservative side." Still, the number of dead bears did exceed limits in specific areas. Some 112 bears were killed in the eastern Panhandle in the first day of hunting, though the limit was set at 40. 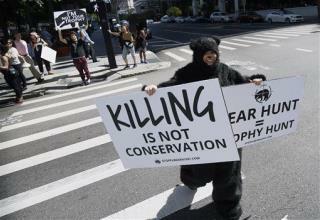 Hunters in Central Florida felled 39 more bears than the area's limit of 100. "The bears haven't been hunted in 21 years, so they're relatively naive," says the commission's bear expert. Instead of murdering wild animals that you're not going to eat, go to Obozo's town of Chicago and hunt down gang members, and leave them laying in the street. We must clear the land of these hairy intruders to make way for people safe roller coasters and strip malls. Don't let the natural world stand in the way of progress.